OMSAIRAM!One of our Sai Sister had been wanting to have a baby,even tried for adoption. She is 50 years old and glad to have a bundle of Joy. BABA answered her prayers and send her a lil baby boy. A lady from Sholapur, wife of Sakharam Aurangabadkar had no issue during the long period of 27 years. She had made a number of vows of Gods and Goddesses for an issue, but was not successful. She then became almost hopeless. To make a last attempt in this matter, she came to Shirdi with her step-son Vishwanath and stayed there for two months, serving Baba. Whenever she went to the Masjid, she found it full and Baba surrounded by devotees. She wanted to see Baba alone, fall at His feet and open her heart and pray for an issue, but she got no suitable opportunity. Ultimately she requested Shama to intercede with Baba for her when He was alone. Shama said to her that Baba's Darbar was open, still he would try for her and that the Lord might bless her. He asked her to sit ready with a cocoa-nut and joss-sticks on the open courtyard at the time of Baba's meals and that when he beckoned to her, she should come up. One day after dinner, Shama was rubbing Baba's wet hands with a towel when the latter pinched Shama's cheek. Shama feigning anger said, "Deva, is it proper for you to pinch me like this? We don't want such a mischievous God who pinches us thus. Are we Your dependents, is this the fruit of our intimacy?" Baba replied, "Oh Shama, during the 72 generations that you were with me, I never pinched you till now and now you resent my touching you". Shama, "We want a God that will give us ever kisses and sweets to eat; we do not want any respect from You, or heaven, balloon etc. Let our faith unto Your Feet be ever wide-awake". Baba, "Yes, I have indeed come for that. I have been feeding and nursing you and have got love and affection for you". Then Baba went up and took his seat. Shama beckoned to the lady. She came up, bowed and presented the cocoa-nut and joss-sticks. Baba shook the cocoa-nut which was dry. The Kernal within rolled and made a noise. Baba said, "Shama, this is rolling, see what it says". Shama, "The woman prays that a child might be similarly rolling and quickening in the womb. So give her the cocoa-nut with Your blessings". Baba, "Will the coconut give her any issue? How people are foolish and fancy such things!" Shama, "I know the power of Your word and blessing. Your word will give her a string or series of children. You are wrangling and not giving real blessing". The parley went on for a while. Baba repeatedly ordering to break the coconut and Shama pleading for the gift of the unbroken fruit to the lady. Finally Baba yielded and said, "She will have an issue". "When?" asked Shama. "In 12 months" was the reply. The cocoa-nut was therefore broken into two part, one was eaten by the two, the other was given to the lady. The Shama turned up to the lady and said, "Dear madam, you are a witness to my words. If within 12 months you do not get any issue, I will break a cocoa-nut against this Deva's head and drive him out of this Masjid. If I fail in this, I will not call myself Madhav. You will soon realize what I say". She delivered a son in one year's time and the son was brought to Baba in his fifth month. Both husband and wife, prostrated themselves before Baba and the grateful father (Mr. Aurangabadkar) paid a sum of Rs.500/- which was spent in constructing a shed for Baba's house "Shyamakarna". Such things hurt Baba more than anyone. All, this is a sacred place to worship and not a place of fight with fellow devotees. Leave your EGO behind when you enters this temple. She "is" 50 years old and glad to have a bundle of Joy. 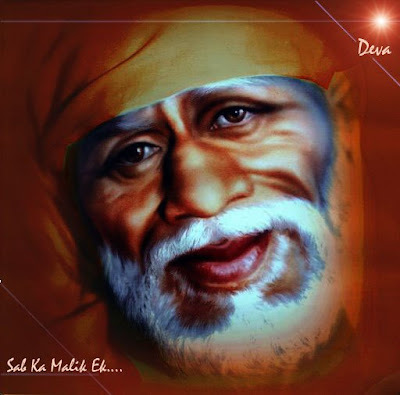 Sai Ram Pratap Ji, You dont have be to sorry. You have raised a valid point. I have been experiencing the same cold war feeling among the devotees. My comments was not meant for you or Anupam ji. it was a generic comment and applies to all of us. Baba is the head of this family, like a father. And when he sees his egoist children are fighting just for nothing, how much painful this could be for him. All, We have facebook, ocrkut and other social netwoking to boast about ourself and feed our ego, but pls spare this lil place of Baba. Your ego is like your shoes, you may need one but dont bring it inside the temple. Ravi bhai this msg is for u too,Plz dnt delete source of the Photos that we take from other sites. I didn't say that this was not for me. For me the SOURCE means the REAL SOURCE. if a website is copying images from other website, and if someone copies those photos and use it in another site, the actual source remain same. No credit should be given to the site who copied it in first place. Please DO NOT mention name of other FORUMs as source. Its against POLICY. Yeh dil hai ke manta nahi. Its not about your choice or my choice. Its about following the rules of DM. if a member doesn't follow the rules, his/ her post will be MODERATED which includes modification or deletion of post without notifying the user. No one is above the DM, neither me nor you. On a side note, you have been a supporter of this Forum and always helped us. I hope to see your continuous support and contribution in future. OMSAIRAM!Ravi bhai BABA always told us to folow the path of Truth and humbly. If we follow His teachings in our DM....Truth....Success is not possible by telling a lie. Page created in 0.381 seconds with 67 queries.